Happy Wednesday! On Monday I shared with you the “Be Bold Challenge” I am taking part in. Originally my fireplace makeover was going to be my project for that challenge, but last week we were snowed in and I just couldn’t wait! The kind people at General Finishes were kind enough to supply me with a gallon of Lamp Black for this project. To refresh your memory, my fireplace was painted gray immediately after we moved into this house. Here’s a shot from it’s original makeover back in October of 2011, just 2 weeks after we moved in. And just to bring you all the way back to where it truly started…. The General Finishes Lamp Black adhered right to my surface without any trouble, so I just went on my way giving it two coats total. And before anyone tells me, YES, I know there is a fireproof paint and I could paint my brass surround black, but I LIKE THE BRASS. So many people last time kept trying to tell me to paint that part, but I like it- it lends to the vintage charm for me! Anyhow, back to the fireplace…. two coats and voila! You might also spy something else new in there, like the gorgeous hide rug from Rugs USA. Do you see how the TV just disappears up there? Oh that makes me so happy! The room has not had its complete mini-makeover but it is getting there! I plan to keep the blue pillows and mix in some black. And of course we will do the pipe built ins for the Be Bold Challenge. Here’s a closer look at the mantle. I love this paint for it smooth finish. The mantle looks so sleek! I love how all of my shiny decorations just pop off the black! And if you look closely in the picture below you can see how our cables just disappear. 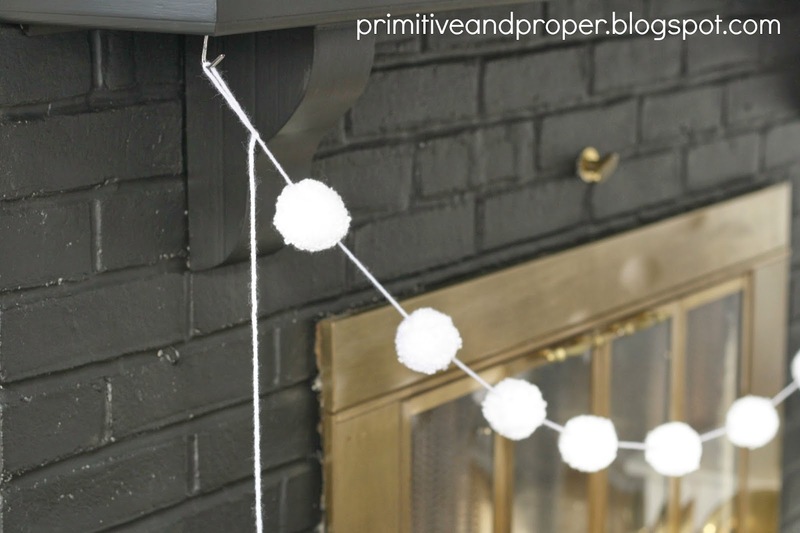 This pom pom garland made by my bestie just bounces off the black and adds a playful touch. They are available in her etsy shop! Now, let’s take a look at the new rug, which suits the look this room is headed for perfectly! It’s already flowing better with the rest of the main floor. Rugs USA was kid enough to provide me with a rug to review, and I immediately knew what I wanted! 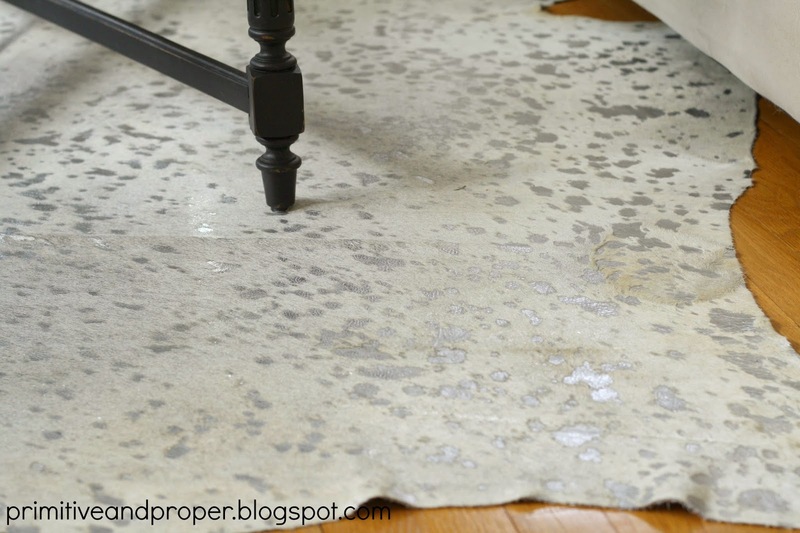 I selected the Serendipity Devour Cowhide White Rug. This rug is MAGICAL! It blends my love of rustic, natural, and glittery all in one with its silvered flecks and white/light hide. The kids came home from school and saw it and flipped! My kids love when rooms change for the better around here! I love the look of it paired with the black coffee table, and mixed metallics of the space. Here you can see it playing off of the light coming into the room…. SWOON! I absolutely love it! I could not have found a more perfect rug for this space! Thank you so much to Rugs USA for providing me with this rug, and to General Finishes for providing me with the paint to get this room’s mini makeover rolling along! I am off to get my first haircut since August. I think I am bringing back the bangs. We’ll see. I love it and I think the brass looks great with the black! I didn’t even SEE the TV until you pointed it out, nice camouflage! Black and gold–go, Wake! (Just kidding.) I was hoping you were going to post this fireplace! Cassie, this looks amazing! 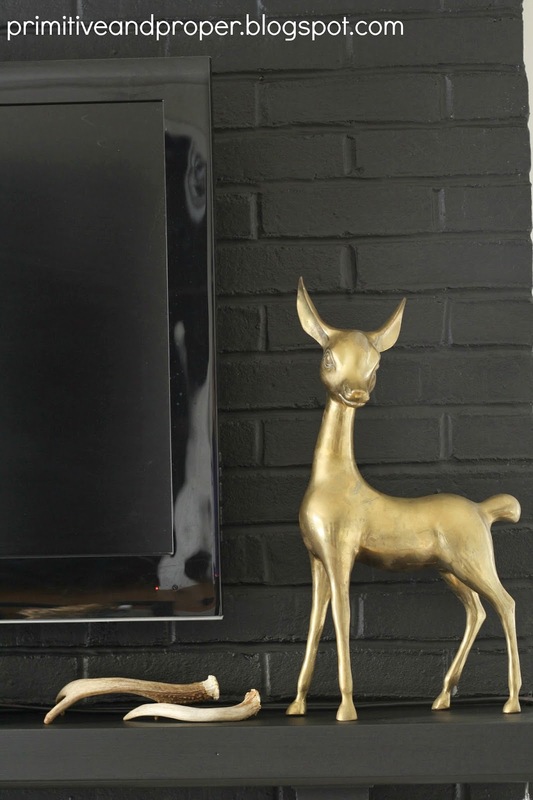 Love the drama of the black paint and how it hides the TV. And your rug is gorgeous. The whole room is looking so sophisticated! I love this room, 100%. 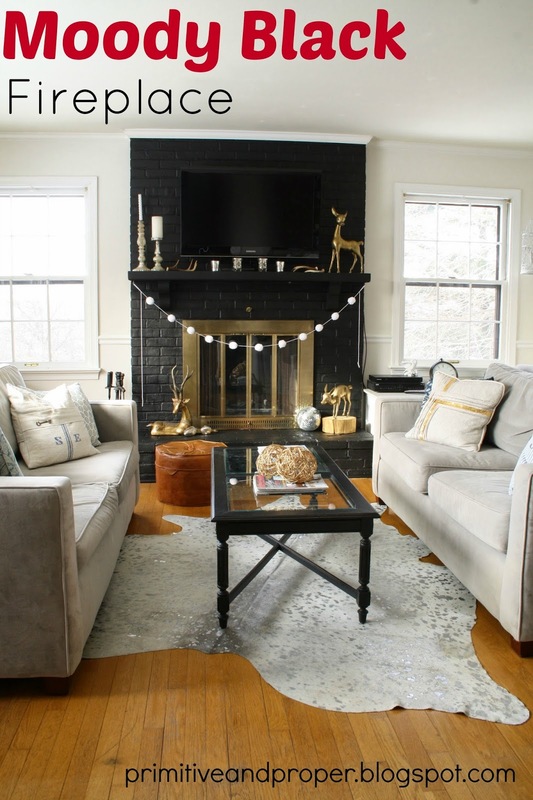 The fireplace looks gorgeous in black, and the rug is perfect! I’m glad you kept the brass! Totally having fun watching your vision come to life. It looks beautiful! I didn’t even notice your TV… what a great idea… I love the black! Lovely! And I am digging the brass on black look too! HOLY COW, everything is gorgeous!!!! I’m trying to get a client to paint her fireplace black and I bet this will seal the deal!! Love the brass and that rug! You’re right on the brass. (But you’re always right so whatever.) The whole room is really starting to look like your style! That rug is super fun too! 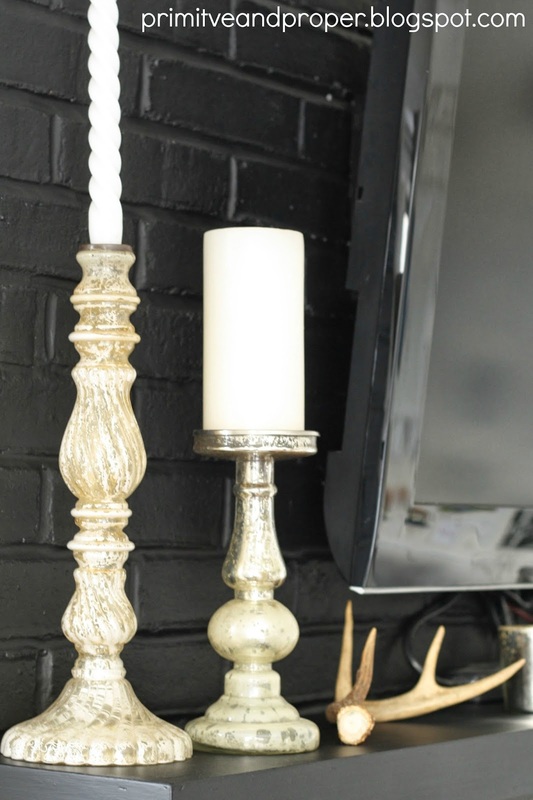 I’m with you on the brass fireplace – especially against the black, it looks like a gorgeous gold accent. Because, um, that’s what it is! The new rug is GORGEOUS too!! Oh, the black looks so sleek and sophisticated! I especially love the way the TV and all the cords disappear. And I’m digging the brass too. Definitely a cool vintage vibe! 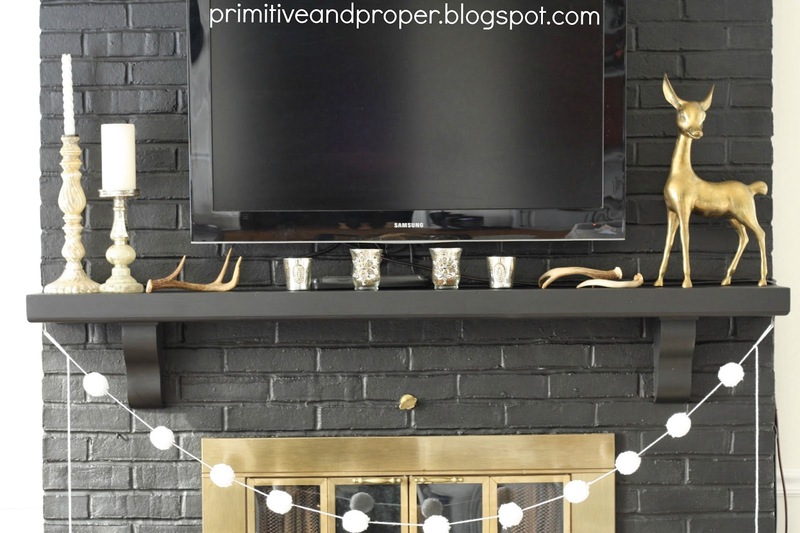 And I thought the gray fireplace was awesome…love the black even more! I am jealous of that gorgeous rug, I didn’t even know I wanted one until now, wow! How fun is that rug! Looks great and so YOU! Loooooove the black fireplace Cassie! It’s such a powerful focal point for the room. I really like that the tv totally disappears above it, and how your brass accents stand out against it. That hide is just gorgeous! It’s the perfect accent for the room:) Quick question? Are you planning to put panels up over the windows? If so, are you thinking something patterned? I think that would add another layer of awesome to the space. Also I’m totally sending you a neon pillow so you can plop it on the couch. That way it’ll be like I’m there with you bc I seriously wanna be in this room, like always! Not in a creepy way though! It is so elegant! I was just wondering about the tv cables when you pointed them out – brilliant! Looks great! The brass and shiny accessories you have all work together beautifully. Painting the bricks black is absolutely brilliant! I love the way the TV and cables disappear! Fabulous! Lucky you to receive such a gem. I can’t wait to get out my cow hides….They are stored away until we move. Holy moly. That black looks so good on the fireplace!! 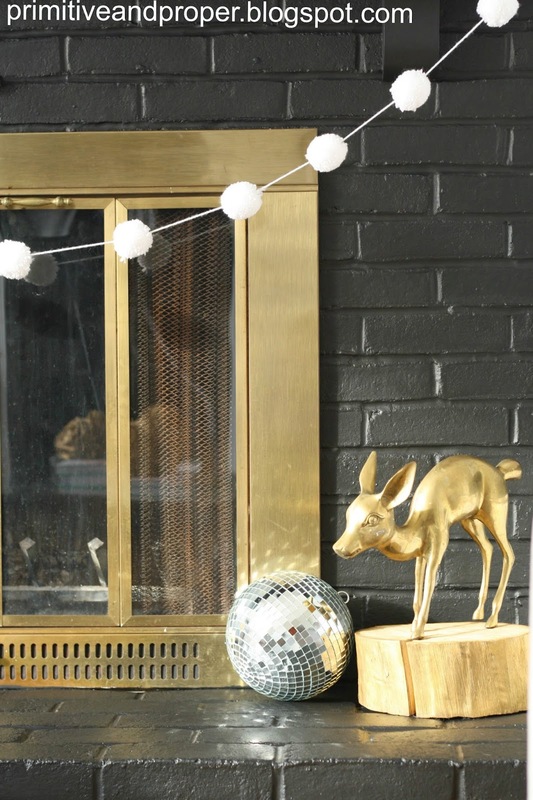 And agreed…your deer and Pom poms definitely pop! Okay—that rug. Aaaahhhhhh! I love love love it! The brass looks great, especially with the brass deer accents. And I say bangs. I know you probably already had the haircut but I am just giving you my two cents. Your eyes are great so highlight them! I love that whole set up. The fireplace looks perfect now, and I love the brass too, it is perfect with all your little touches. Amazing how different it looks from the grey to the black. Love that the TV fades into the background too. Great job. PS That rug is da bomb! LOVE! 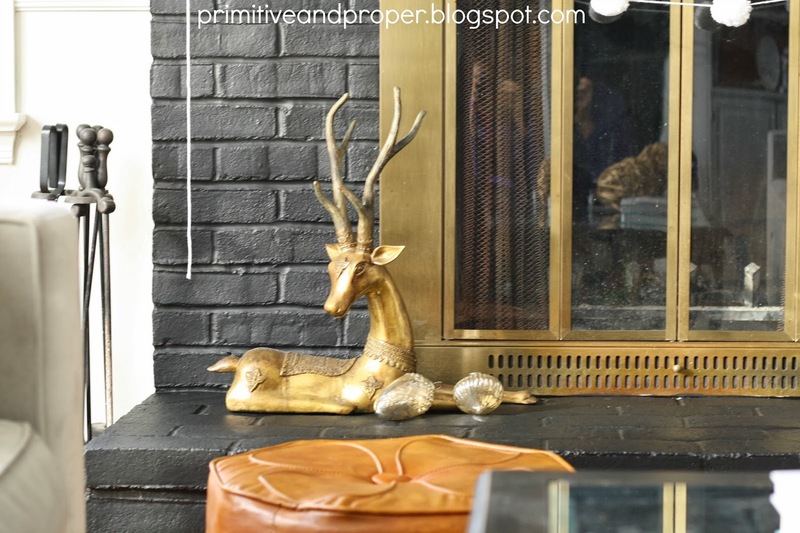 Awesome fireplace makeover and I’m so glad you kept the brass! It adds an interesting contrast to the black. I don’t think I would have even noticed your tv if you hadn’t mentioned it! And, the rug….fantastic! 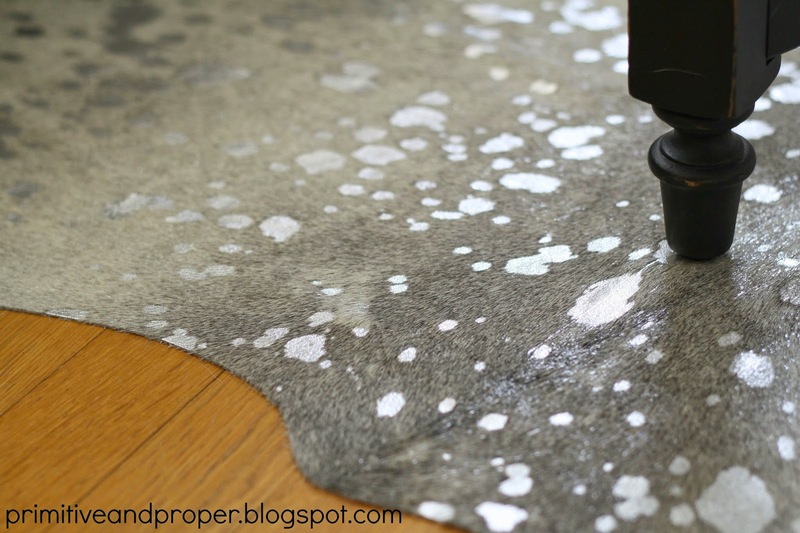 I am so in love with cowhide rugs and this one is great! hey jealousyyyy. that rug is making me jealous!! and i like the brass too. I think if you were to paint it the fireplace would look too modern! plus, your brassy animals need a home! Oh mylanta! Love! I really love the brass, too! And even more than that…I love that you’re sticking with your gut and what YOU like instead of what the masses say is “in”. The point is having a home that you feel is beautiful and feel comfortable in. You brass animals look right at home with the fireplace surround. 🙂 Wonderful job as always, girl! Loving the whole look of your living room. The black fireplace looks Amazing! I didn’t notice the metallic before that is niiiicccceeee! It goes well witht he black fire place! 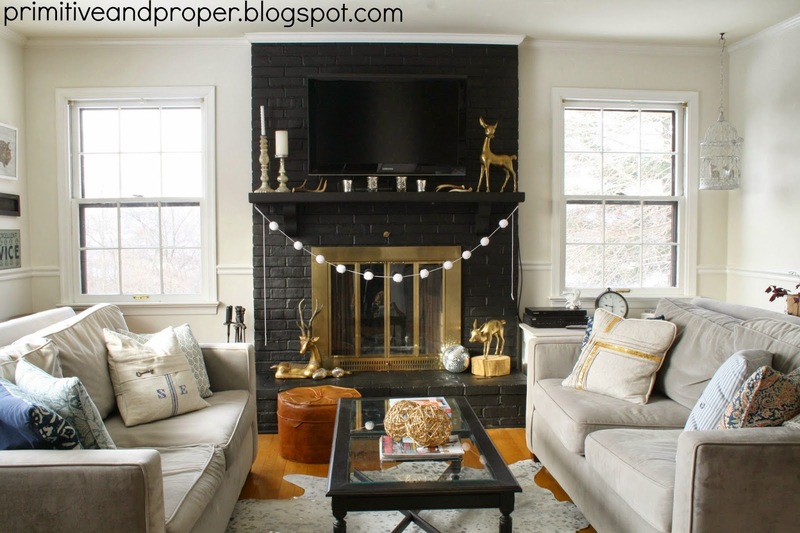 The black fireplace is perfect – I really liked the gray, but I think the black is even better! 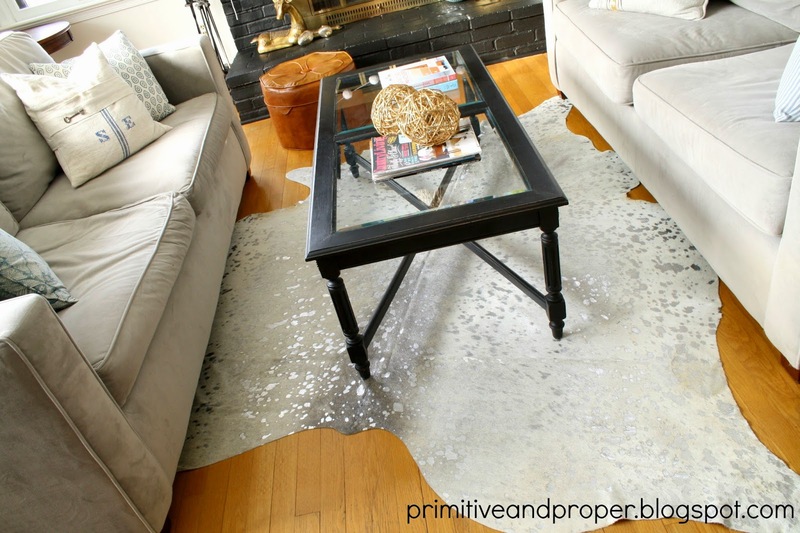 That hide rug with the metallics in it is amazing as well! You are making me want to paint my fireplace black!! Love how your TV blends in with it. I love the brass too, it really pops against the black! Love the fireplace; its making me think hmm, maybe I should move the tv in the other room 🙂 And the rug has just the right touch of sparkle! The fireplace looks like such a focal point now. The rug is perfect too. I didn’t even see the TV till you mentioned it. It looks so glam now, I love it! Love it all. I’ve been trying to convince The Man that painting the interiors of the built-in entertainment center black would be a great thing, paired with lighter walls. He’s FINALLY going to see what I mean! looks so good! Love the black with the brass .. that rug is fabulous too – love the metallic! Absolutely gorgeous! The room has a totally different look now. So glamorous and sophisticated! I love the fireplace black. The tv literally disappears from the room shot. Plus all that brass really pops! I’m loving on that rug. I want to know how it holds up with a dog. I’m thinking about getting a cowhide but wasn’t sure if I could with my 2 dogs. I mean they ruined my jute rug once. Let me know! Really, really loving the black. All the brass (the animals plus the doors) look amazing against it! Beautiful Cassie! Lamp Black is my favorite black paint to use and I love how the TV just disappears. Dark tones and brass are a favorite combo of mine right now as well. This is a nice improvement. The black really grounds the space. The black looks great…so sleek! I am glad you left the brass. It’s striking with the black fireplace. Good choice! I love that rug Cassie! It is just perfect for your living room. I am wondering if I can find a space for that rug. Love it. Love the fireplace, and I’m so glad you kept the brass. It looks awesome against the black. That rug is amazing!! Oh my goodness! I LOVE the fireplace! It looks so good and I love that the tv and cables just blend in. Awesome. I think it looks amazing! Great work! Loving the new color of the fireplace Cassie, and yes, the t.v. does sort of disappear… that surprised me. I am so obsessed with your fireplace that color! It looks SO GOOD! Very chic. Your home is so beautiful. How fun that we have the same rug!!! The black looks great! I love the brass and black together… good call on not painting that back in the day. Yes, on the black. So bold and gorgeous! And that rug is perfecto! I love how this turned out! It’s so bold and beautiful. The rug makes the room too. Can’t wait to see more. the fireplace is amazing. I did not even see that TV until I read it! I also like the rug! blingy cowhide rules! 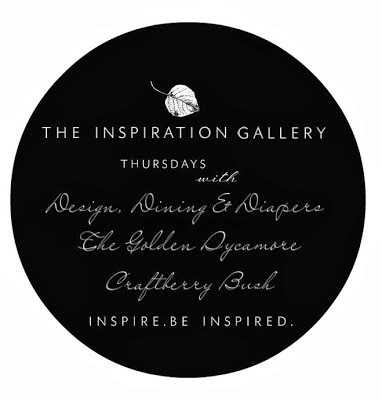 I saw your FP featured at Inspiration Gallery at Craftberry Bush and had to stop by and see it. Glad I did…it is amazing! Not many people think to paint their FP black and how perfect is that colour to make the TV fade away. Love that you stood your ground and kept the brass – your accent pieces and the floor colour tie it altogether. Your new rug is fantastic! Your room is really coming together! This looks amazing! I never would have thought to go so dark, but I love the look. It really makes it even more of a focal point. Beautiful ideas for Fireplace areas, Great concept and design as well. Thank you so much for sharing this with me, Cassie. I guess in the midst of being on maternity leave I missed this great post. 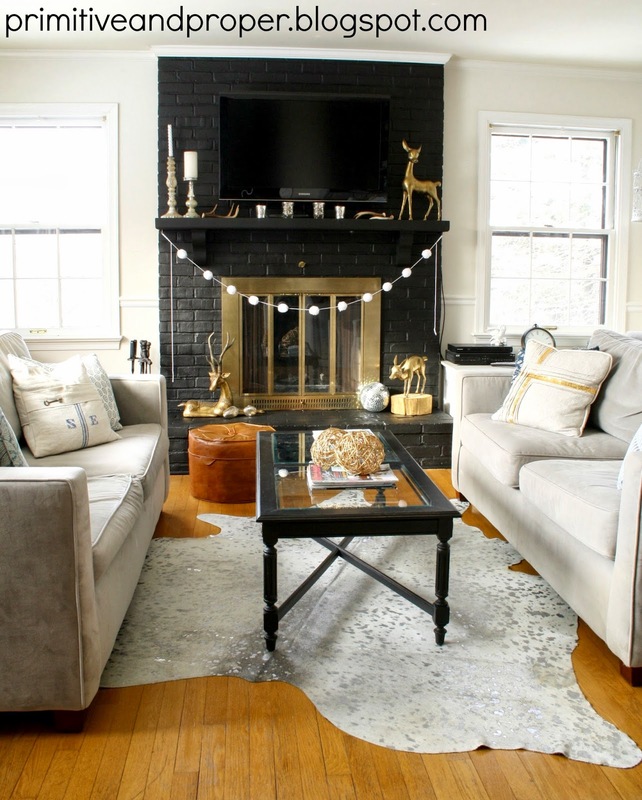 I love the rug and the black fireplace looks fantastic! !